Beautifully Remodeled Condo Across from Hyatt! There are many condos to choose from, so why not choose the one with the best location in Incline Village? You will be two blocks from Incline Beach, and Diamond Peak Ski Resort is just a five minute drive (or take the shuttle that stops across the street and leave the car at home). This is one of the CLEANEST vacation rentals you will find! This two story condo is across the street from the world famous Hyatt Resort with restaurants, night life, casino, and spa just a two minute walk. Enjoy drinks at the Lone Eagle Grill lakefront restaurant without the hassle of parking, or grab a coffee around the corner and people watch. There is always something happening in this part of Incline Village! At just over 1500 square feet, you will find everything you need to make your getaway comfortable. The upstairs features an open living area with 15' vaulted ceilings, soft leather couches, 48" Samsung Smart HDTV with Sony DVD/CD player, ipod/mp3 adapter, gas fireplace, pub bar dining area, and lots of cool art. The kitchen is fully equipped with maple cabinets, granite counters, range, microwave, fridge, toaster, coffee maker, and some basic supplies. There is a private utility room with washer/dryer and also a remodeled powder room upstairs. From the living area you will have access to the incredibly spacious deck overlooking Lakeshore Blvd. The deck is approximately 270 square feet with plenty of room to dine, BBQ, or just relax and enjoy the view. The downstairs features all three bedrooms and two beautifully remodeled baths. The master has a king bed (yes Goldilocks, Papa Bear likes a firm mattress) with private bath, CD player, mirrored wall, and lots of room. The guest bedroom features a queen bed, and mirrored closet doors. The 3rd bedroom has a futon which folds into a double bed, twin bunkbeds, mirrored closet doors, 15' Sharp flat screen TV, Sony DVD, and lots of games/toys in the closet for your kids. This unit has been substantially updated with all new kitchen, new wood laminate flooring throughout, updated bathrooms, knotty pine doors, tile entry, two skylights, reindeer chandeliers, and many other updated features. There is LOTS of off street parking with easy access to this unit. My home's interior was COMPLETELY repainted in 2015 and YES, we have high speed internet with WiFi! We are an active family who enjoy the year round beauty of Lake Tahoe. The benefit to renting our place is that we are SO CLOSE to whatever activity you are seeking. We launch our Sea Doos in the summer and ski at Diamond Peak in the winter. We keep our condo stocked with new art work and nice furniture so it feels like home, not a trashy rental property. We encourage you to provide feedback after your stay! Best location on the North Shore! Being on Lakeshore means easy access year round to dining, walking trails, Hyatt, even the Diamond Peak ski bus stops across the street. We have an excellent 3rd story deck with views of Lakeshore Blvd and filtered views of Lake Tahoe. Our deck is unique as it is LARGE, private, and really does extend the living area during warm weather months. Enjoy! Views of redwood trees surround this unit, while the 3rd floor deck has views of the Lakeshore Blvd walkway and filtered lake views. Sheets, blankets, pillows, etc. are provided. Bath and kitchen towels are provided. Please bring your beach towels. 3rd floor deck with patio table and chairs for outdoor dining, umbrella, lounge chairs, and stainless steel 4 burner gas BBQ!. My HOA does NOT have a communal pool however all renters receive an IVGID Beach Access pass to the two Incline Village private beaches including Burnt Cedar Beach which has a pool right on Lake Tahoe! This condo was set up perfectly with bedrooms downstairs and kitchen and living room upstairs. The location was extremely convenient. I highly recommend this condo. Thanks for your review Kate. I am glad you enjoyed your stay! The condo was clean and just as it was described. We enjoyed several evenings on the large deck, grilling and playing games. I had a few questions while we were there and the owner was very quick to respond via text and very helpful. I would recommend this rental for sure! Great location, easy walk to Hyatt and the lake. 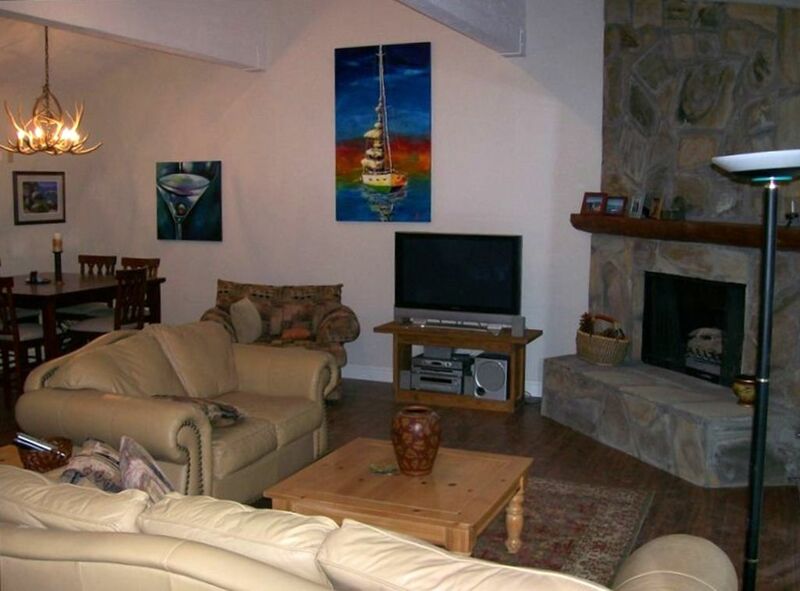 Spacious well equipped condo in a fantastic location to enjoy the lakefront and the local area. Can't wait to return. Great house & location was key! Thanks for allowing us to use your home. It was perfect in every way. Bedrooms and bathrooms were a perfect size and being located on the bottom floor they stayed very cool during the day and at night. Having a 1/2 bathroom upstairs was great and all the fans that you supplied. The house was exactly as described and very spacious for the 6 of us. The deck was large and such a bonus to sit outside in the evening. The lake access was in walking distance so we didn't have to drive everyday. The owner was great with getting back to me with any questions I had. Thank you again. Thanks Patti! I'm glad you enjoyed your stay in my home.